Newcastle’s ex-Woolworths in Clayton Street (store #340) has been one of a dwindling number to retain its Woolies signage three years on, as more and more of the chain’s abandoned stores have been taken over by other retailers. Now, as news of the site’s acquisition by Poundworld has emerged this week, the lettering at Newcastle’s Woolies has finally been taken down – though years of weathering have left a very visible imprint (above). There was plenty of activity on site when I passed by this afternoon, and several extra openings have been punched into the hoardings facing Clayton Street since I last captured the scene a fortnight ago. I also braved taking a photo of the Newgate Centre frontage for the first time, overlooked by a watchful security camera. 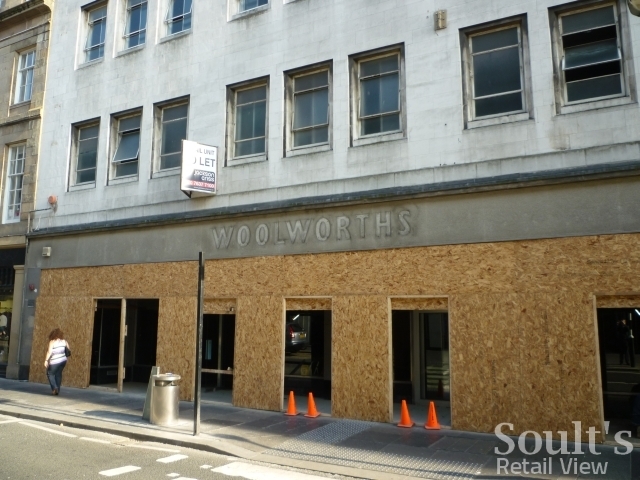 However, given the absence of shops ahead of the centre’s demolition, there isn’t a great deal for any potential criminals to get up to – besides photographing empty Woolworths, of course. Though McAleer & Rushe was granted permission for the centre’s redevelopment in June last year, there’s no indication of an imminent start to demolition work. 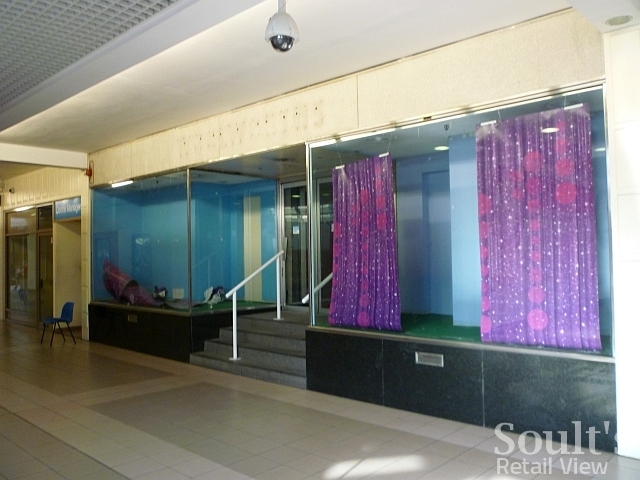 While the inside of the centre is increasingly deserted, tenants including Halfords, Subway and Jessops are still trading in many of the street-facing units. 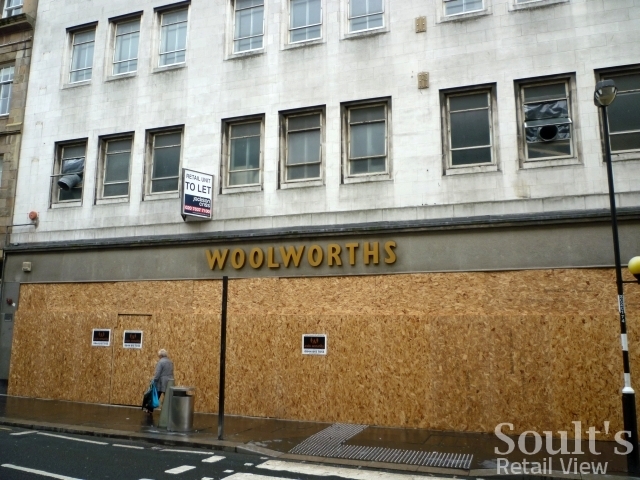 However, it seems unlikely that Poundworld will bother to do anything with the Newgate Centre side entrance of the ex-Woolies site, given that it will, before long, need to be blocked up anyway. 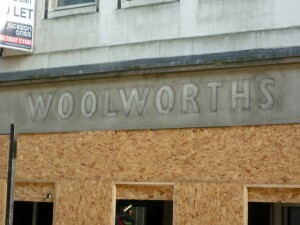 Nevertheless, the Woolworths lettering has been removed from this frontage too, though the rather bizarre remnants of the shop’s 2008 Christmas decorations – as well as the customary black granite stall riser – ensure that evidence of the property’s Woolies heritage won’t be disappearing just yet. Next story Has Britain fallen out of love with Tesco? 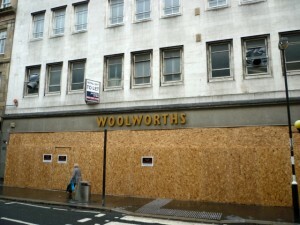 Previous story Has Discount UK signed up for Newcastle’s old Clayton Street Woolies? A photo from a year ago of the Newgate Street entrance shows the double layered lettering with gold underneath the red. Maybe it was the same on Clayton Street? @Graham Soult Perhaps we’ll have to chalk it up as one of life’s (or the North East’s) many mysteries! I noticed t’other day that one piece of retro branding remains resolutely attached to the building – the burglar alarm is still sporting a 70s/80s “woolmark” symbol. That’s an interesting question, Jonny, and one I have no immediate answer to. Odd musing but it’s always baffled me as to why the signage was gold. I *think* the Durham Market Place store may have also boasted such a coloured logo before its final refurbishment. Was there a particular era when Woolworths stores opted for gold over the more familiar red that I’ve been completely ignorant to? Official policy or strange anomalies? As Poundland prepares to float, what are the secrets of “the new Woolies'” success?